Has your little girl been a fan of The Descendants since she first heard of The Isle of the Lost? The Disney series, Descendants, has captured a generation of kids like the classic evil villains in a Disney movie. The main characters, Carlos, Jay, Evie, and Mal are all the offspring of the villains we grew to know and love from Disney fairytales. This particular character, Evie, is the daughter of the evil queen. While Jay is named after Jaffar and Mal is named after Maleficent, we're guessing this smart and kind character is actually named after the main trait of her mother. . . evil. We wouldn't like to be named after evil but we're pretty sure the dark twist to her name gave her plenty of character. She does really well when she gets to study at Auradon prep. And whether she's going to grow up to be a fashion designer or a scientist, we're pretty sure she'll always rule at what she does! This costume embraces Evie's love of fashion. 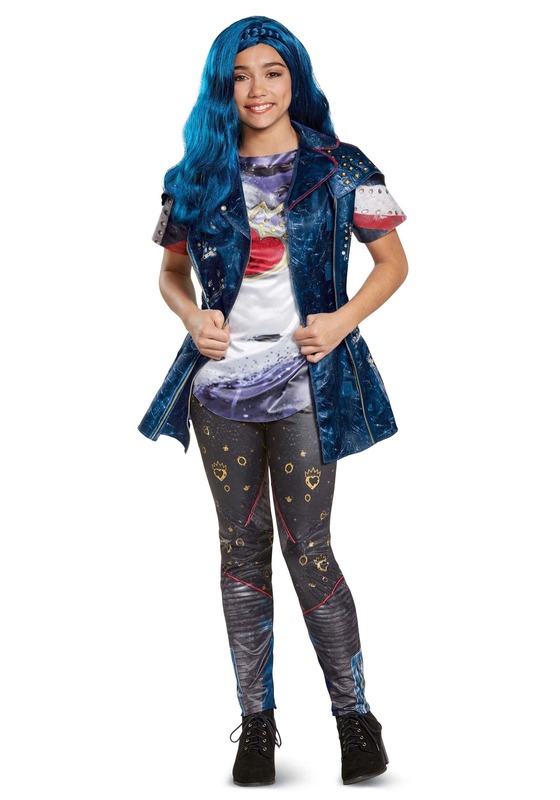 She has leggings with printed zippers, crowns and hearts in a gold pattern, and a galaxy background. The shirt has a large heart with a crown to emphasis Evie's large heart. The ensemble is topped off with a long vext that zips up the side and has cool collars and shoulder pads. There are zippers, studs, and pockets printed throughout. 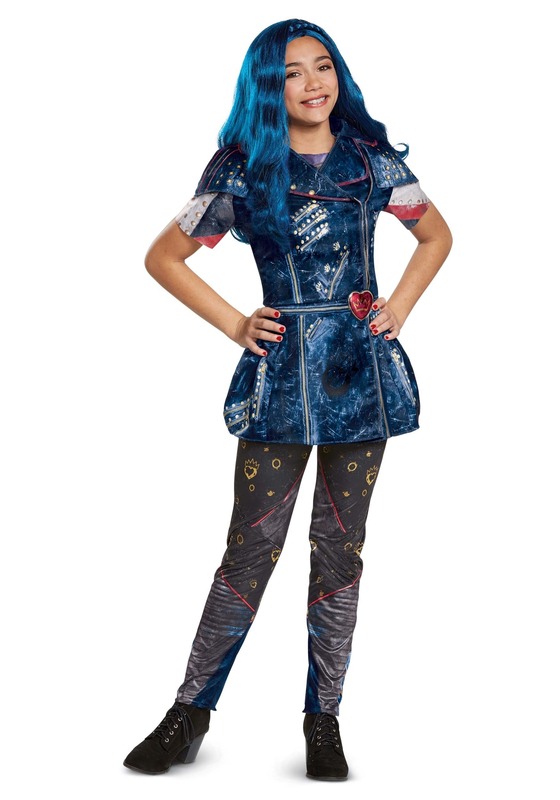 To complete her look, find Evie's wig in our catalog, her blue hair is a trademark! Whether she's wrecking havoc on The Isle of the Lost or she's concocting mixes in chemistry, Evie does everything with confidence. Just be careful when she's got a mirror on hand, that's where her power comes from! Your daughter can even pair up with Mal and Uma for an awesome group ensemble. Your little girl might not be an actual villain but we're sure she can stir up some trouble this Halloween!